As you may be aware, exactly one week ago on the 2nd of February, I presented my first address to Cabinet this year, and by so doing opened the executive branch of our Government. Later in the same week, I addressed the judicial branch of our Government at the opening of the 2016 Legal Year at the Supreme Court. Today, I am here to complete the "trinity" by opening the legislative branch of our Government. It is no coincidence that "trinity" or in other words the three organs of State function perfectly in our country. Indeed the Executive, Legislature and Judiciary encapsulate the separation of powers in our Republic. This is the pride of our democracy. Today, in this country, we are also witnessing another "trinity" which symbolizes just how far we have come as an independent and democratic nation. We have the Founding Father of our Republic, Comrade Sam Nujoma. He is the man who led the fight for independence and laid a solid foundation of our Namibian House. This is the foundation of peace, security and democracy that we enjoy to date. He was succeeded by Former President Comrade Hifikepunye Pohamba who stabilized the situation, solidifying and consolidating our peace. They have been followed by me, the newly elected third President of Namibia, who has been charged with the responsibility of bringing prosperity to the people. There are not many countries in the world where one can witness all former heads of state and the current President living peacefully in the same country and working together. That is how we are building a Namibian House. The trinity continues. Comrade Speaker, you are the third Speaker of the House, following on from our First and Founding Speaker, Comrade Mose Tjitendero - May His Soul Rest in Peace. He laid the foundation of this House. He was followed by another illustrious Son of Namibia, Comrade Theo-Ben Gurirab and now you Comrade Speaker. While on the issue of "trinities", let me turn to an issue which has been ablaze on social media, namely the new Parliament building. I have received numerous messages from people imploring me to halt the construction of the building. In this connection let us all be reminded of the separation of powers between State Organs which I alluded to earlier. In terms of this, each of these State Organs has to act independently, and that is good because it provides for checks and balances in our democracy. To underscore this point, the Executive cannot interfere in the Legislature, just as the legislature cannot interfere in the day-to-day operations of the Executive or the Judiciary. This separation of powers dictates that the building of a new Parliament is a matter of the Legislature and not a matter of the Executive. Therefore, calls for the abandoning of plans to build a new Parliament building should be, if at all, directed to the Speaker of Parliament and not to the Presidency. Furthermore, I have noted with concern that some of these calls are emanating from honourable Members of Parliament. So perhaps there is a need for an open debate on this matter in the Parliament. That being said, I would like to note that since Independence, Government has always prioritised developmental issues. That is why the bulk, of our budgetary resources, has always and continues to be directed towards the education and health sectors. Construction of buildings that are symbols of key institutions has never enjoyed priority over developmental objectives. That is why the new State House and the Supreme Court were constructed only two decades after our Independence. In the context of preserving our Constitutional values that we are lauded for in the International Community, three things are of importance, namely processes, systems and institutions. While Namibia is leading in this regard, let me briefly elaborate on these fundamental concepts. Firstly, we need processes that are inclusive and transparent. We need processes that will instil confidence in our democracy, and that will minimize the risks of rumour mongering and conspiracy theories. For instance, our electoral processes must be transparent and above board so that those who lose elections admit that they have been defeated in a transparent way and do not complain and run to the courts. We want to achieve the same with regards to our tendering system. That is why we have cancelled tenders, due to processes and procedures that were questionable. Secondly, we need robust systems that will ensure that service delivery is not compromised. For instance, if there is a dispute regarding election results the system must remain intact and the public service should continue to deliver goods and services to the people. Thirdly, when all else fails, we need strong institutions that will have the final say. An example of this is the infamous 2000 United States election between Former President George W. Bush and then Vice President Al Gore when there was a dispute regarding the counting of ballot papers. Despite the furore, President Bill Clinton was still in office and there were no armoured vehicles in the streets. The process of recounting was transparent and televised for all to witness. When all else failed, the matter was taken to the courts, Al Gore, having received more popular votes admitted defeat to President George W. Bush as the latter had won using the Electoral College System which is unique to the USA. Similarly, when we quarrelled about election results following the 2009 elections, the systems continued to function smoothly while the challenge was taken to the court. That is what I am talking about when I say we need processes, systems and institutions to preserve our constitutional values. I had the opportunity last week to open the judicial year, where I reaffirmed my unwavering commitment to protect the independence of the Judiciary. I am glad that I am standing here today to open one of the most important legs upon which our democracy rest, namely our Parliament. As we are gathered here in Parliament -the ultimate symbol of our commitment to democratic rule - we must bear in mind that without a collective spirit, in which we look out for each other and the well being of each and every Namibian citizen, we can never achieve true democracy. Therefore, when I refer to the spirit of Harambee it is not a mere slogan but it is a call on the people of this Nation to adopt an ethos of unity, devoid of selfish ambition, and to pull in one direction for the sake of National prosperity. There is much for us to celebrate, 26 years after Independence. Our democracy has withstood several challenges and continues to be a beacon of hope and motivation, not only on the African continent but in the world as a whole. Our democracy provides a solid foundation on which we can build a Nation of peace, unity and prosperity. We are well aware that democracy alone is not the panacea to hunger and poverty. This is why I have said and continue to say that the people do not eat democracy. As elected representatives of the people, our responsibility is to ensure that we make use of our democratic platforms to actualize the aspirations of the electorate. The year 2015 can be described as a call to arms. It was the year in which as President, I endeavoured to rally the nation behind a shared Vision through themes such as, War on Poverty, War against corruption, No Namibian Must feel left out and Harambee. I am certain that by embracing these themes and applying them to our policy making decisions, one day we will be able to eradicate poverty. In 2016, it is time to turn words into reality, it is time to implement and therefore I refer to this year as the Year of Implementation. The eyes of the Nation are on us. I repeat, the eyes of the nation are on us. As the Legislature, you have a key role to play in our development efforts. You represent the platform of inclusive political dialogue and national debate and are, therefore, crucial in spearheading Namibia's developmental agenda. At this juncture I would like to commend the members of Parliament for the work done last year. Many of the laws that were passed by Parliament have gone a long way in improving the livelihoods of our citizens. Congratulations for your good work. I would now like to focus specifically on the issue of poverty and the role that Parliament can play in the war that we are waging against this crippling scourge. As Parliament, you represent the voices of the poor and the disadvantaged people. I would like to quote Article 45 of the Namibian Constitution which says, "The members of the National Assembly shall be representative of all thepeople and shall in the performance of their duties be guided by the objectives of this Constitution, by the public interest and by their conscience." Therefore, every day you come to Parliament, you carry with you the hopes, fears and dreams of hundreds of people who look upon you with the expectant hope that you will speak and argue on their behalf, guided by the Namibian Constitution, their interest and your conscience. Having spoken of the constitution, since today is Constitution Day, let us pause and thank the founders of our Republic for having given us a splendid Constitution. I am glad to see many of you here today, who spearheaded the process, and I am proud of having been Chairperson of the Drafting Committee. In the same vein, let me acknowledge the efforts of one of our citizens, Mr. Chris Jacobie, who single handily fought for this day, Constitution Day, to become a national day. So happy Constitution Day. As we are commemorating Constitution Day, we must raise the level of debate. We must look at the way we can strengthen our institutions. For one, the debate should not focus on trivia. Rather it should be directed towards improving the democratic institutions that we so dearly hold in our hearts. This is what so many Namibians fought for. In this regard, there is yet another trinity I would like to refer to. On this day 48 years ago, a stalwart and icon of our struggle for independence, Comrade Andimba Toivo Ya Toivo was sentenced to 20 years imprisonment to be served at the infamous Robben Island Prison. It was at this trial where he famously said, "We are Namibians, and not South Africans. We do not now, and will not in the future, recognise your right to govern us; to make laws for us, in which we had no say; to treat our country as if it was your property and us as if you are our masters. 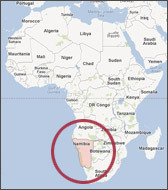 We have always regarded South Africa as an intruder in our country. This is how we have always felt and this is how we feel now and it is on this basis that we have faced this trial" Moving words indeed. It is due to the steadfastness and courage of heroes such as Comrade Ya Toivo, that today we can celebrate living in an independent Namibia, where we govern ourselves and make our own laws. I therefore congratulate this icon for his strength of character and courage. Today is also a day we recognize the maternity of humanity, our women. Under the Constitution of the Republic of Namibia we are all obliged to protect and defend human rights and the lives of all our people especially the rights and lives of women and girl children. We therefore recognize the important role played by women who are the pillars of strength on which our nation rests. In this regard, as we recognize the importance of our women, let me take this opportunity to congratulate the newly elected Chairperson of the National Council Honourable Margaret Mensah-Williams. This represents another trinity, as we celebrate Constitution Day, the same day one of our icons who fought for the principles encapsulated by the Constitution was sentenced to prison and the same day we acknowledge our first female Chairperson of the National Council. Because of what I mentioned above, I have a strong belief in our Constitutional Democracy for; we have seen that when citizens lose hope in their constitutions, institutions and in elected officials, they place their hope elsewhere and this is usually to the detriment of peace, solidarity and national unity. We should, therefore, ensure that our Parliament is an institution where the voices and preferences of the people, especially the poor, should be represented. In this year of implementation, our Parliamentary committees will have their work cut out in investigating several poverty related issues and in monitoring and evaluating our policies and national development plans to ensure that they are having the desired effect in the wider war against poverty. I have great faith and belief in your ability to carry out these vital responsibilities. On the issue of whistle - blowing, as an avid football supporter, I have seen many referees or "whistle-blowers" blowing wrong whistles. Those that watched the recent match between Chelsea and Manchester United can attest to this. So let us ensure that when we blow our whistles, we blow for the right reasons and not to settle scores. The bills I have just listed are crucial in our efforts to combat a number of burning issues that we are currently faced with, namely poverty, violence against women and children, inability of local entrepreneurs to participate in the business market, rising cost of housing and unavailability of land. I, therefore, urge you to debate these bills knowing that you are not speaking on your own behalves but on behalf of the country's poor, the country's young and old and the country's women, men and children. My main role here today is not to delve into the policies of Government and to provide account of our achievements or shortcomings. That task I shall carry out during my State of the Nation Address. Let me, however, just state, for now, that the State of Our Nation is Sound. We have a growing and a stable economy, and we continue to be favourably rated by international rating agencies. 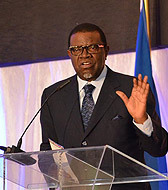 Just recently, Namibia stepped up ten places in the Corruption Perception Index rankings by Transparency International and is currently ranked as the 4th least corrupt country in Africa. Unlike what some wanted to portray, the Namibian Government is not broke. To the contrary, we are a credit worthy Nation and the long-term outlook for Namibia is positive. This Government will continue to build on the legacy of fiscal discipline and prudence that was built over twenty-five years. Furthermore, within less than one year, we have demonstrated that we mean business when it comes to poverty eradication, promotion of transparency and building an inclusive Namibian House. This assertion is supported by the following actions. We have significantly increased the old age pension; asset declarations took place; ministerial declarations of intent and performance agreements were released publicly; and a shared Vision is being promoted. Finally good progress was made with the development of the Harambee Prosperity Plan that will be released during the State of Nation Address. Today, I am here to mainly encourage the Legislature by saying let's put aside personal differences and the desire to settle scores. Let us think of our people. Let us think of the poor and pull together as one people in one direction with one goal, prosperity for all. In this regard, let me share with you a quote by Jean-Francois Cope who said, "I invite everyone to choose forgiveness rather than division, teamwork over personal ambition." 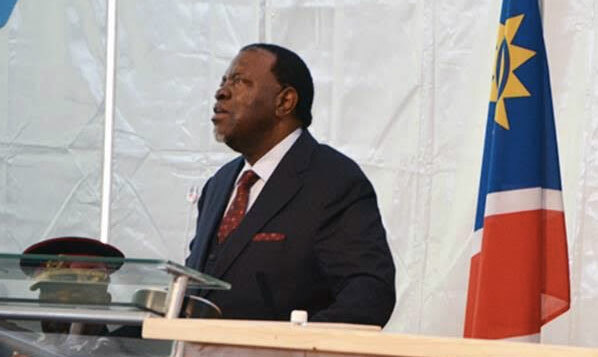 Let us adopt the spirit inspired by these words and burry the hatchets of hate and distrust and choose forgiveness, choose to work as one team, team Namibia in the spirit of Harambee and put aside our personal ambitions for the greater good of the nation. Let the Parliament of the Republic of Namibia be the representation of true African democracy in the 21st century. Let this Parliament be the foundation of the Namibian House. Now I have great pleasure and honour to declare the Third Session of the Sixth Parliament of our Republic officially open. May you all have a productive and successful session. 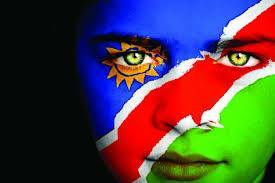 Long live the Republic of Namibia, Long live the Land of the Brave.